In our active lives, it's hard to find time to exercise without having the best double jogging stroller. When there are two babies to look after, it's near impossible to find the time to exercise without them. That's why we keep hearing about ways to exercise with our babies. It's the growing thing, from mother and baby classes to jogging options using a stroller specifically designed to help you with the task. It's great. You get your exercise, and the babies get to go with mommy on something she loves and some fresh air into the bargain. Then you've got to consider that the more active the parents are, the more active a child ends up being, and considering we all want the best for our children, it's good to get habits like these ingrained early. But buying a stroller to go jogging brings with it a whole new host of problems. That's why it's important to know what the options are, so you can make an informed choice and guarantee you buy the best stroller you can. Here are our reviews with a neat comparison table followed by the features that actually matter. When you're looking to buy a double stroller for runners and joggers, you're really looking for two things. First, you need a stroller that's going to be comfortable for you when you're jogging. Second, you need a stroller that makes sure your two babies are as comfortable as possible, especially if you're going off road or longer distances. If you're buying a stroller specifically to use when jogging, then the type of wheel and the suspension your purchase has will make an absolutely huge difference. Bear in mind any shocks will be absorbed by the wheels and suspension first. If you buy a stroller with a sub par suspension system, or hard, rigid wheels then any bumps you go over will be transmitted straight up through the frame into your arms, and more importantly, into any passengers! High end strollers have air filled wheels, similar to wheels you'd find on a mountain bike. They also tend to have suspension systems already built in, which can normally be adjusted. What this means is you can make sure that you have the right ride for you and your children, every single time, no matter where you're going. We've all been on long plane journeys and been wildly uncomfortable, whether it was because we didn't have enough leg room or the person next to us refused to give us any space on the arm rest. Now imagine being placed in a chair like that, but not being able to get up and out of it if you want to. That's why it's so important to make sure that the seats are as comfortable as possible. In general, especially if you tend to run over rougher ground or trail run, then deeper seats are better. It's also worth having a look to see how adjustable seats are, because we all know how our kids can be. One twin might like to lie back and relax, staring at the clouds, whilst the other wants to see everything and everyone ahead. Most importantly though, is padding. Jogging strollers tend to have seats with a lot of extra padding to make sitting in them whilst you run over bumps and make turns extra comfy, so if you're looking at a stroller with no padding and it's advertised for jogging, get suspicious! It's also worth checking the safety harness before you buy. Most strollers have decent harnesses, but strollers equipped for jogging can sometimes have better harness designs that are safer and more comfortable on rougher terrain. The first thing to say is, make sure your handlebar is a comfortable height! Have you ever gone for a run holding your arms above your head? No? Good, because that would be crazy. But you can imagine how uncomfortable it would be, right? Most good strollers have adjustable handlebars that can be set to multiple different heights, for even the tallest and shortest amongst us. You're also going to want a handlebar with a decent amount of padding. This doesn't matter so much when you're just walking around town, but when you're running you'll come to appreciate that extra layer of protection on your hands. Trust me, after a long run pushing two babies in a 30lb stroller, your hands will be feeling it enough! Whilst we're talking about handlebars, it's also worth discussing brakes. Seems like a weird segue, but a lot of jogging strollers have hand brakes that are mounted on or near the handlebar, as well as a footbrake. If you can, it's worth buying a stroller with an easily accessible hand brake, because they are so much easier to use when you're moving than foot brakes, and you only need one loose rock or slippery big of ground for accidents to happen. If it ever does, you'll be happy you had your brakes in easy reach. Like on cars, the best types of brakes are drum brakes. What this means is the brake clamps down all the way around the axle, putting force on every part and stopping you faster. Again, these are worth looking out for, especially if you regularly run on rough or loose ground. Now you might be able to deal with a bit of rain, but your children probably won't, especially because they're sitting down low and leaning into it. That's why a decent canopy is important. It blocks everything, rain or shine. A good canopy will have excellent coverage of the seats, probably has a viewing window, and if it does, the window will definitely be UV resistant. Whether it's hot and stuffy or cold and miserable, nothing makes a quick stop off better than a snack and drink. Plus all that running can cause nature to call at the most inopportune moments, so strollers with large amounts of secure storage space are always appreciated. When you're looking for storage on a stroller designed for jogging, deep or easily sealed pockets are a welcome addition. Nothing worse than having to double back because a bottle bounced out whilst you ran. Finally, it's worth talking about durability. After all, there's no point in buying a stroller, and shelling out a lot of money for something that's going to fail after a few weeks. When you're checking how tough your stroller is, focus on the areas that see the most use, like the wheels and seats. It's these areas that are going to be taking the brunt of the force when you're running, and a little bit of extra toughness here, like double stitched linings, goes a long way! In my opinion, this is the single best double jogging stroller out there. It's got so many options that are perfect for the amateur jogger and the kids, that make sure that every run is as comfortable and easy as possible, for all three of you. First off, the handlebar is massively adjustable, with nine different levels, as well as being padded, which makes it incredibly comfortable even on longer jogs. It's got hand activated rear drum brakes, like the kind you'd find on a sports car, which stop it effortlessly. On top of that, the wheels are large and air filled, so they take impacts and keep everyone going with the least amount of fuss. For the little guys inside, there's a top quality suspension system to keep them comfy, plus all the normal things you'd expect to see, as well as a really decent all weather canopy that comes down low to cover everything that's needed. Plus, it's a really high quality stroller anyway, with all the mod cons like a really easy two stage breakdown that can even be done one handed, loads of storage space and easily accessible pockets! There's no real downsides, except that it's a tiny bit heavier than some lower quality strollers. 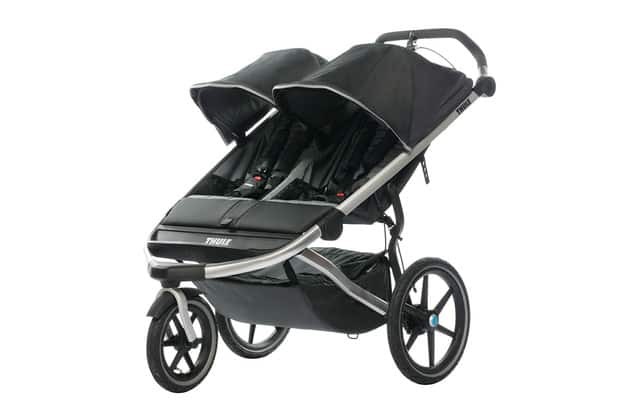 But if you're looking for the most convenient stroller to take on your runs, the amount of features and sheer quality on offer here means this is the one you should choose. 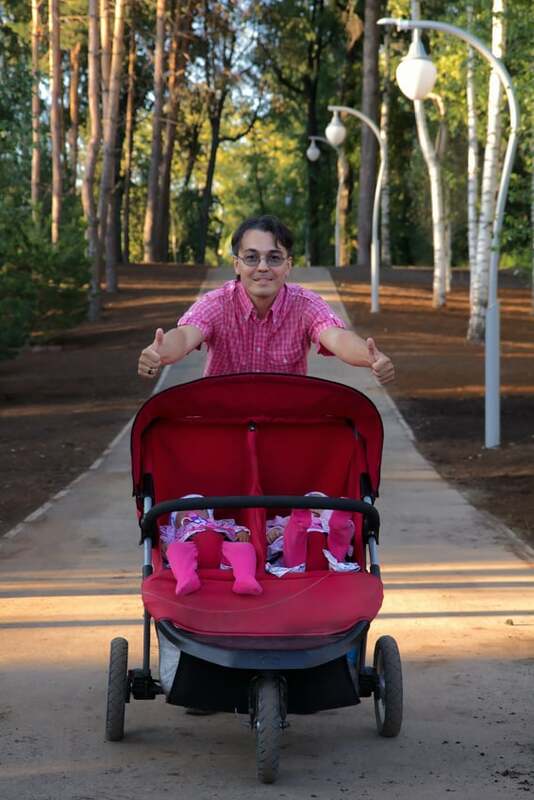 This Baby Trend stroller also made our best stroller for twins list. Lightweight, really easy to push and manoeuvrer, and surprisingly budget friendly. The Baby Trend Expedition is a really good stroller for city and suburb use, as it's air filled bicycle type tires run incredibly smoothly on side walks. But don't let that make you think it won't also go all terrain. Even though it's a lightweight stroller, the frame is robustly built so it gives a really smooth ride for even the smallest passengers. Another huge bonus on this front is the five point harness, which is adjustable in multiple ways to fit any occupant. Being able to recline each seat by itself is a huge bonus, as is the canopy, which is incredibly versatile. No matter what it's like out there, your kids are going to be safe, from rain, wind or sun! There are a couple of smaller issues, but nothing that derails the whole thing. Sometimes the wheels need a little bit of adjustment to run smooth, but that's easily fixed. I also don't like foot activated brakes on strollers meant for jogging, just because it can be a little harder to hit. Overall though, there's a lot here to love, and this is definitely our number one budget friendly jogging stroller. Another high quality jogger manufactured by Baby Jogger, this stroller is specifically designed to be used whilst running or jogging, and comes with a whole suite of features that are excellently placed and well thought out. Firstly, the ride is exceptional, with heavy duty air filled wheels, a powerful, adjustable suspension system and reliable hand brake that will stop this dead in seconds. It's also really comfortable for the kids inside, with two deep seats that are both individually adjustable, and a huge all weather canopy that can be pulled all the way over for complete coverage. All told, this is very similar to our top choice, which isn't a bad thing, as the BOB Revolution Pro is a fantastic jogging stroller. Given the option, I'd still choose that one, but for one reason only. This stroller doesn't have an adjustable handlebar, so for particularly short or tall women, it could be uncomfortable to use. Apart from that, it's absolutely fantastic, but if you're going to buy it, make sure you can comfortably hold on to the bar. In terms of rough ground, I think this is the stroller you want to use on all terrain out of our list. With its huge wheels, both in size and how far apart they are, the ride is smooth and incredibly comfortable no matter what you're rolling over. The front wheel can be locked for smoother terrain, which is really simple to do. Plus there's a built in, high quality suspension system that keeps the little ones bump free. For such a large stroller, it's surprisingly easy to move, and everything about it is simple and easy to use. There's some lovely touches too, like the fact that the canopy windows are magnetic rather than studs, so you can literally just reach over and snap them up or down in one go. There are a few minor issues that prevent this being the best, though. The front wheel can sometimes stick and takes a little wobbling to get it moving again, the foot brake is really loud, so might wake light sleepers, and worst of all, the seats are a little smaller than average, so larger or older children might struggle. Don't let that put you off though. These are all really small problems, (even the seat thing, it's not as bad as it sounds) and everything else about this stroller is absolute quality. Another Baby Trend product, another great jogging stroller. This one has all the same creature comforts and technology to keep the little ones safe and comfortable on your jobs, including twin padded reclining seats and a smooth, easy ride with big, air filled tyres. But it's the little touches for mommy that make the difference. Like the storage tray. It's got twin cup holders, which are pretty standard, but it's also got a covered storage tray to keep everything safe, and the best touch, built in MP3 speakers. That means you can plug your phone straight into this and have music whilst you run, without having to wear headphones and lock yourself away from the world, and your babies! So why is this not rated higher than the Baby Trend Expedition? Simple. It's a huge stroller, and for some reason the designers decided to put a pair of wheels on the front of this, instead of the single rotating wheel you normally see. This makes it handle like a tank. It's amazing in straight lines, but getting it round sharp corners will test every ounce of your strength. Apart from that one thing though, this is a fantastic jogging stroller that any mom would be proud to own. 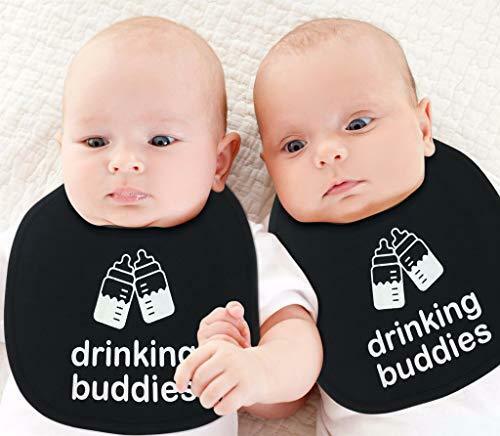 Now that you've read through the list, you should already have an idea of which best double jogging stroller is best for your needs. But as long as you buy something from our top choices, you can relax, because you know that you're soon going to be the owner of a great stroller! Do you regularly take your little ones on jogs with you? Did you find these reviews helpful? Any tips for dealing with sudden showers, bumpy roads or even grizzly little ones? We'd love to hear from you, so let us know in the comments below what you think.